Led by Charlotte Bate, a Fellow of the CIPD and MAD-HR Director. She has over 10 years’ experience as a HR professional, trainer and coach. Charlotte has worked with a variety of businesses across most industries from marketing to manufacturing, construction and engineering. Plus, we have a great team of experienced specialists, lawyers and other experts who deliver engaging, thorough workshops. We can promise you energetic trainers who are highly acclaimed in their specialist field. Managing a Team – a two-day introductory level management course for supervisors or those new to management – leadership, coaching, communication skills and delegation, recruitment, induction, managing performance and poor performance and handling disputes. We design and deliver training courses and workshops across the UK to directors, senior managers, line managers, supervisors and HR managers. We also work closely with businesses to deliver workshops to those employees who are being considered for management positions, or those new to management, to ensure effective succession planning takes place. Workshops are highly interactive – stretching – but fun. They focus on shared experiences and positive action planning. In our legal training, we use ‘live’ case studies all based on the current legal position and our experience. In our Management and Leadership training and coaching, we use team exercises, film, games and practical scenarios to ensure the topic is fully explored and as experiential as possible. Each course is fully developed specifically for the client with the end user in mind. Detailed delegate workbooks underpin the workshops with practical notes to take away. Pre and post course questionnaires are written specifically for each course to assess the level of knowledge of candidates before course attendance. They also help with evaluation of the programme and demonstrate a return on investment. Ideally, budget permitting, facilitators then visit the manager in their business or discuss outcomes by telephone, to validate the learning, offer on the job feedback and further coaching. To add a completely different dimension to our courses, we may also use experienced actors to ensure the delegate experience is as realistic as possible. Feedback from delegates is overwhelmingly positive for use of this practical element of the training. This is particularly impactful with topics such as interviewing skills, appraisal skills, communication skills, leadership skills, dealing with conflict and disciplinary and grievance handling. In reality, we have never had anyone who has not enjoyed and benefited from the experience. Be assured, this is not role-playing as most people know it; we prefer to call it ‘real play’. We have considerable experience in the implementation of Leadership Development programmes. A thorough understanding of the individual business challenges. A Development Centre experience carried out in a highly professional manner with tried and tested methodologies, which allows the individual to step back from their daily operational lives and truly hold a mirror up to their own skills and behaviours. Assessment Centres designed for all job roles up to Director level, containing a variety of relevant activities; incorporating presentations, group exercises, individual exercises and role play, interviews and behavioural profiling. Accredited training through the Institute of Leadership and Management. One-to-one or team coaching for executives and senior managers by our associate Leadership and Performance Coach. An accredited executive coach with over 25 years of leadership experience in a challenging environment. We are developing a series of e-learning courses that you can complete online. They will be bite-size, up-to-date courses to be completed in your time on relevant and popular HR matters. 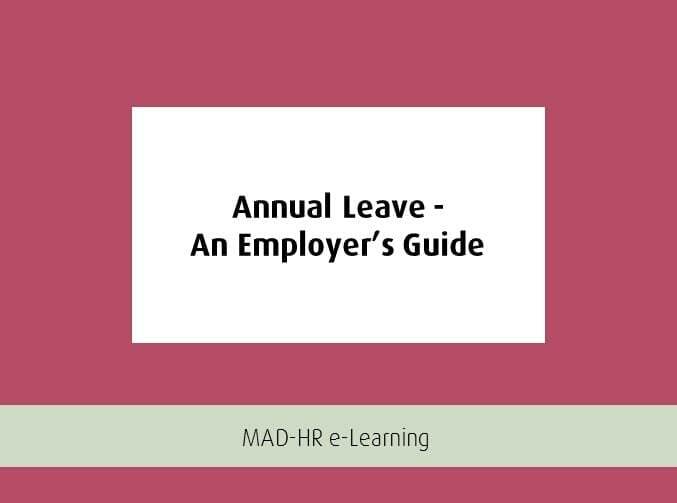 We have also launched a FREE email course on “Managing Annual Leave – An Employer’s Guide”. 5 sessions, across 5 days, straight to your Inbox. Sign-up here. Check out our blog pages to take advantage of our free webinars. Book a call and one of our training experts will be in touch.